No sooner had King David put down the rebellion of his son Abaslom when a Benjamite by the name of Sheba led a rebellion against him. The men of Israel rebelled against David and followed Sheba, but the men of Judah remained loyal to the king. Realizing that Sheba was a greater threat than Absalom had been, David called on Abishai to take servants (warriors) and capture Sheba. Joab’s men when out from Jerusalem to capture Sheba. This pursuit took Joab’s men all the way to the north of the Israelite territory, to a town named Abel-Beth-Maacah. Some English versions use Abel Beth Maacah, or a similar variant. In modern Israel this town is almost on the border with Lebanon between Kiryat Shmona and Metulla. 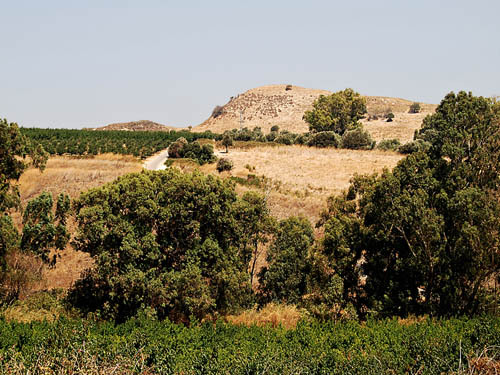 Our photo, looking east, shows the massive mound thought to be the site of Abel-Beth-Maacah. This photo was made the last day of August. The dry tell stands out distincting from the surrounding orchards. Apples are grown in this area. On a clear day one would be able to see the Beka Valley and Mount Hermon beyond the tel. Joab agreed that he would not destroy the city if she would hand over Sheba. She agreed to throw the head of Sheba over the wall. She did what she promised and the destruction was averted. Joab went back to the king in Jerusalem. Abel-beth-Maacah is mentioned in at least two other passages. The city was conquered by Ben-hadad, king of Aram [Syria] (1 Kings 15:20). The city was captured by Tiglath-pileser, king of Assyria, in the days of Pekah of Israel.